Softsoap is a pretty popular and easily recognizable brand. I remember using their hand soaps a lot throughout my life, as I’m sure many of you have as well. Since I mostly use their hand soaps, it was a bit odd for me to try their body washes as I always thought of them as primarily a hand soap company. Yes, I know soap is soap… but you know what I mean! 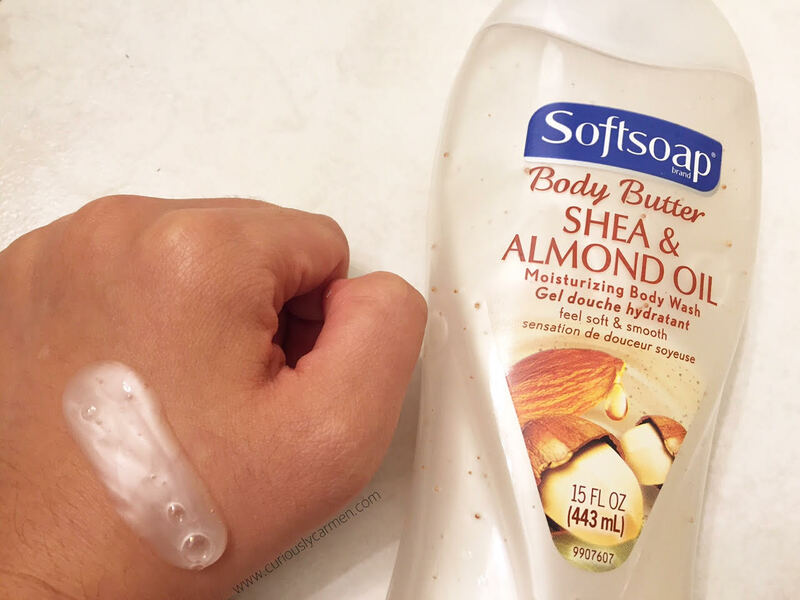 The Softsoap I will be reviewing today is off their body butter line, which suggests that it is a very moisturizing body wash! The scent I purchased was the shea & almond oil, because I thought they would smell wonderful together. Both are also very hydrating and moisturizing products. Indeed, I was right and I really liked the smell of this! Although I do prefer my fruity scents, this one made me feel more elegant and luxurious. The soap is a pearly white colour. There are also tiny microbeads inside the soap, as you can tell more in the bottle compared to my hand. Whenever I shower, I use about a quarter size amount on my loofah. This soap does not lather up as much as other body washes I have had, but it still does a great job in cleaning. Afterwards, the scent really stays on to your skin and is noticeable! 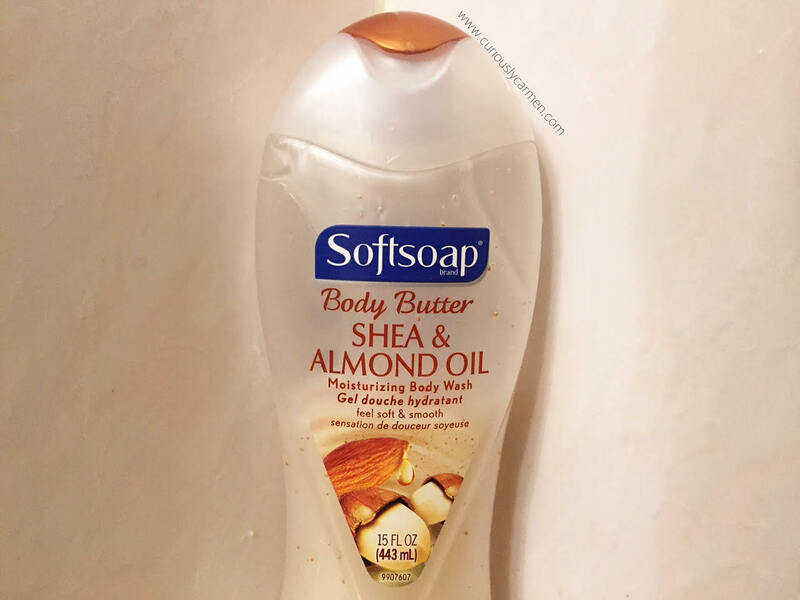 That’s one of the things I love most about this body wash, as I feel clean and refreshed, and smell like shea and almond oil! 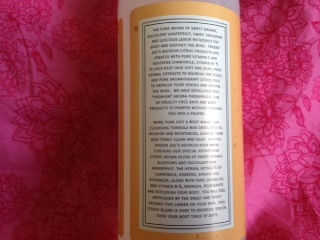 Here is the back of the body wash, with the ingredients incase you’re interested. Cool, I didn’t know that Colgate & Softsoap were in the same corporation. But then again, most of the products out there are owned by a small handful of conglomerates. However, I won’t go all Communications student here because I could talk about corporations all day! 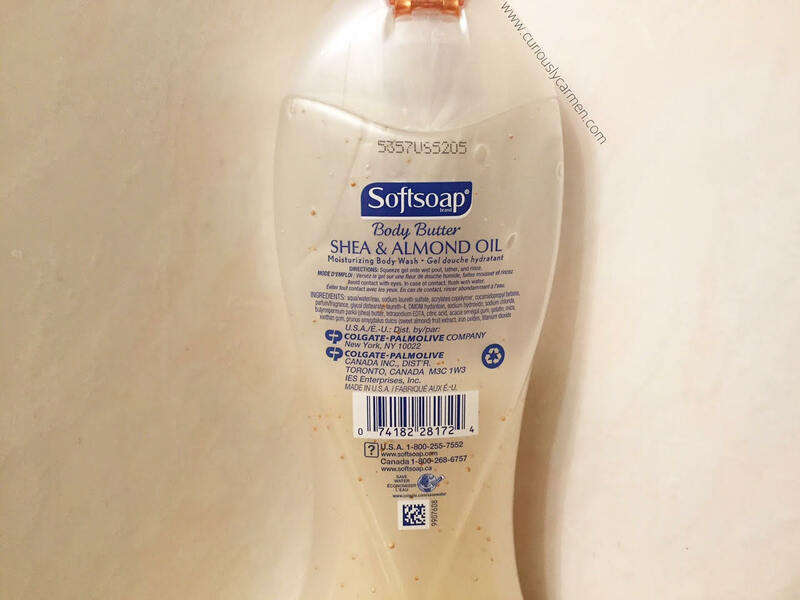 Overall, I would recommend the Softsoap body washes, particularly the shea and almond oil one. They do a good job in cleaning, and make you smell wonderful afterwards. The price is also very affordable and widely available everywhere! Funny enough, I first came across Caprina from the boyfriend! Last year, he was suffering from dry and itchy skin and got so fed up with it that he looked up ways to make his skin less dry. The internet suggested Caprina, and seeing that it was widely available at the supermarket, he gave it a try. 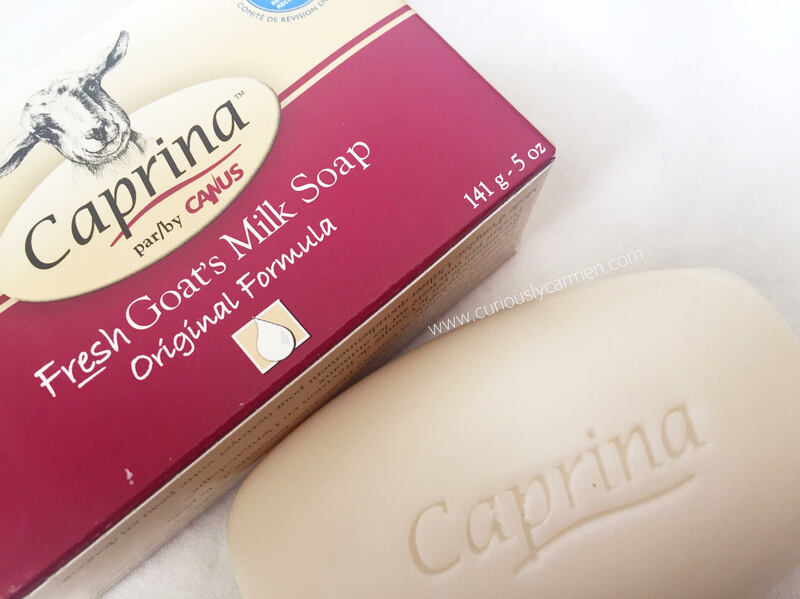 Since then, Caprina has been our go-to soap brand and we have purchased this product well over five times in the past year. When I told him that Caprina was going to send me some products, he was very excited to try more of the line out! The products I received were the body wash, body lotion, and bar soap. Up until now, the only Caprina product we had purchased were the bar soap in original and olive oil. I didn’t like the olive oil one because of the scent, and I found it wasn’t as creamy as the original. 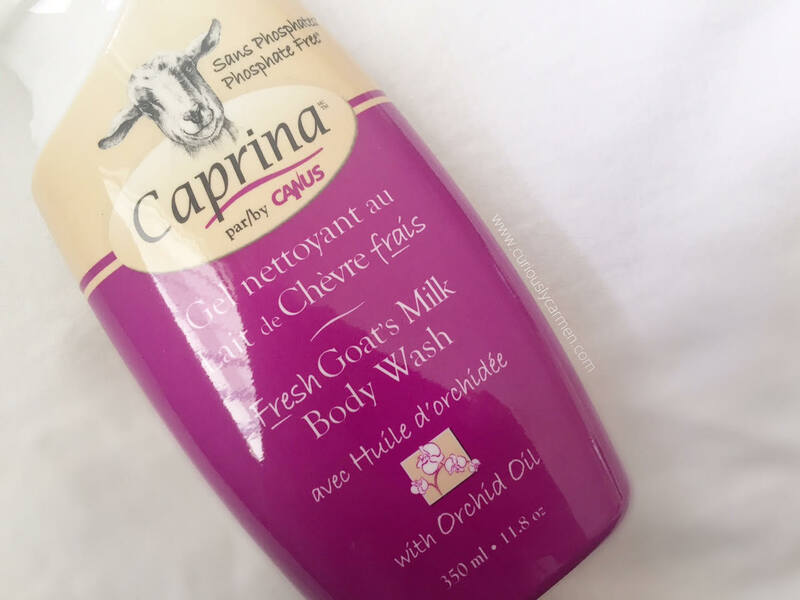 The basis of Caprina products is that everything is made with goat’s milk. 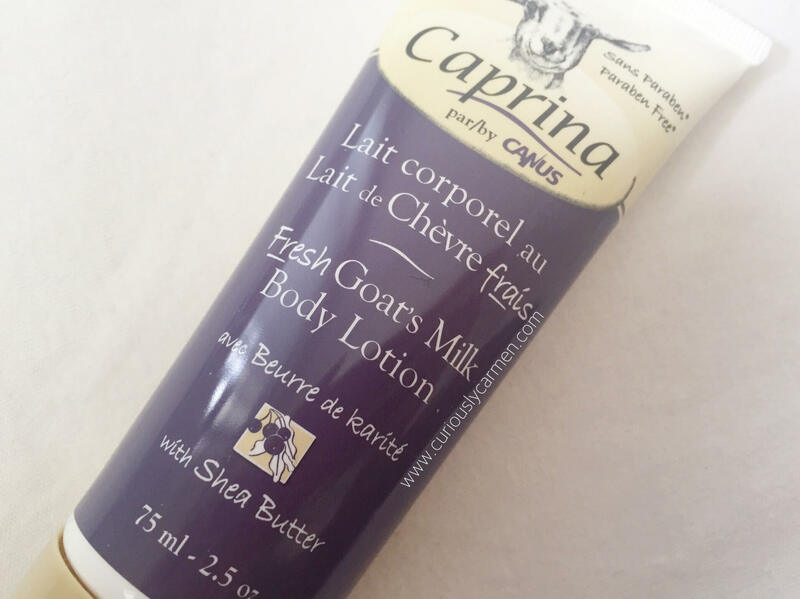 Goat’s milk is super hydrating for your skin, along with other ingredients in the products. As well, Caprina is a Canadian brand based in Quebec, so that’s a plus! Starting off with the original bar soap, I have been using this regularly for the past year before Caprina reached out to me. I really like this soap because it cleans very well, and has a creamy lather to it. It is also richly moisturizing, which you can tell once the soap becomes wet. I always feel super clean after using this soap, and it leaves a nice, light scent on my skin. I have nothing but good words to say about the bar soap! The body wash was new to me, as I had only tried the bar soap. However, I was very pleased when I found out that this product works just as well as the bar soap! It is also richly moisturizing, and makes your skin feel quenched and clean afterwards. This one has a light feminine, floral scent due to the orchid oil. The third and final product I got to try was the body lotion. The body lotion felt light, and absorbed quickly into my skin without being sticky. Compared to the other two products that have a lighter scent, the lotion smelled more fragrant so I wasn’t expecting that. 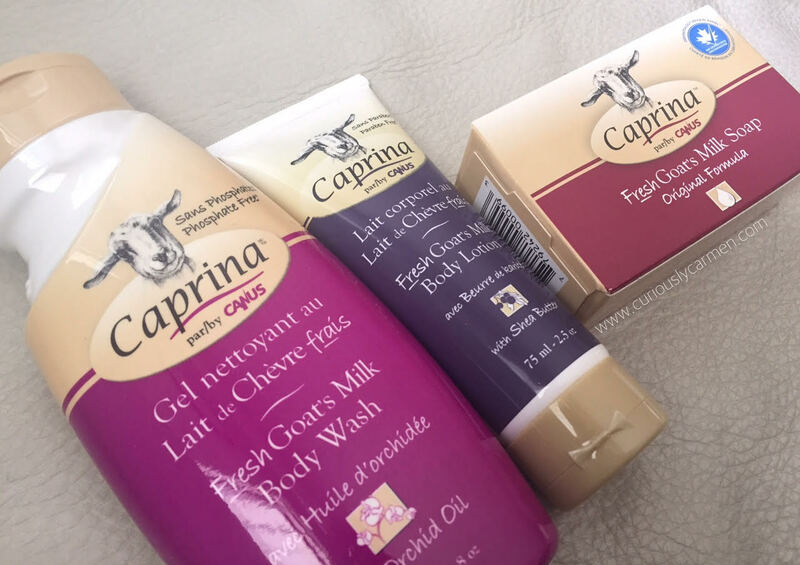 Overall, I really love Caprina’s products and am glad that I was able to try two more of their products out! They are also very affordable and great quality. You seriously can’t beat the price for how great these products are! We usually pick ours up at Pricesmart during our weekly grocery trips. The bar soap retails for $2.50 CAD each, body wash $6.99 CAD each, and body lotion $3.99. I love Trader Joes food products. A few months ago, I went through a phase of going crazy over their food products, because it was so good and (mostly) healthy! Unfortunately, the closest Trader Joes to where I live is in the country next to me, so I can’t simply stop by when I have free time. I’m seriously debating on getting a US debit/credit card just to fuel my Trader Joes love. Anyways, the last time I went to Trader Joes a few months ago, I was strolling down the aisles and saw that they sold body wash. Needless to say, curiosity got the best of me and I ended up buying it. I think it was around $5-6 USD. The description on the label made it sound super awesome, so I was very excited. “The pure aroma of sweet orange, succulent grapefruit, tangy tangerine, and luscious lemon refreshes the body and smoothes the mind.” is what the first line read. So obviously, what kind of woman is not going to be attracted to great metaphors like that? Props to their marketing team. However, I think they over-exaggerated with the description. The scent of the body wash isn’t that strong, contrary to what it says on their label. After taking a shower, I was a bit disappointed because I couldn’t smell much of the body wash on my skin. Since I was disappointed with what little scent it had, I started to neglect it and left it sitting in my shower over the past months. 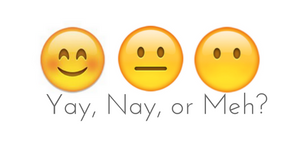 I recently decided to give it another chance, which is why I am writing this review now. It says that you can also use this as shampoo, so I decided to give it a try. As a shampoo, it worked a lot better and formed a great lather, even with a small amount. But I would suggest using a lot of conditioner since this doesn’t really moisturize your hair. I felt that my hair was drier than normal afterwards (didn’t use conditioner to test this out). Anyway, needless to say, this body wash is pretty average, so don’t let their description deceive you, like what it did to me. I think if I didn’t read the description, I would have liked it a lot more, but I did have high expectations for this product. 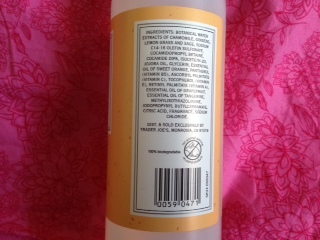 I should also mention that there are a lot of quality ingredients in this body wash, if you look at the picture above. (botannical water extracts of chamomile, ginseng, lemon grass, sage, essential grapefruit/tangerine oil, vitamin b5, vitamin c, vitamin e, vitamin a) ^ I’m not sure if I would buy it again. What else did I get at Trader Joes? On a side note, if anyone reading this is going down to the states and wants to get me some TJ cookie butter, let me know and I’ll pay you back 🙂 Hope you enjoyed the review!